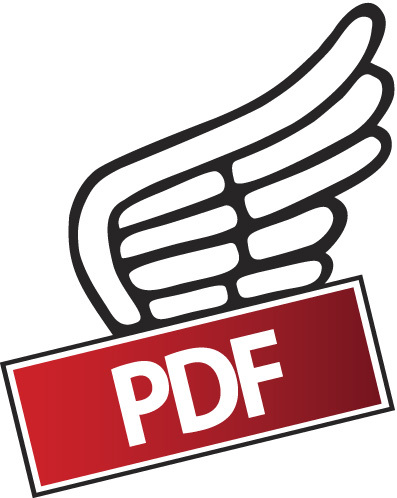 This page contains information about choosing a database to search in and rudimentary information on search strategy. 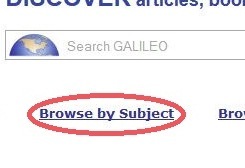 This is the first page you'll see after clicking to open GALILEO - it is the GALILEO Discover Basic Search. 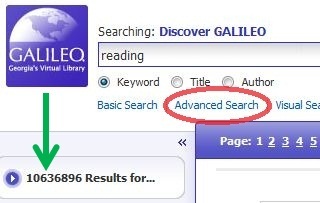 You can begin your search here, but if you're using several search terms or are having a hard time finding appropriate results using this Basic Search, you should go to the Discover "Advanced Search." 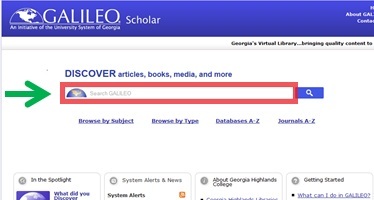 If the GALILEO Discover Basic or Advanced Searches are not focusing in on your topic, you should go to a specific database related to your topic to search. Below are two ways to find one. If you click on "Browse by Subject," you will be able to choose a specific discipline to search in, such as History. If you click on History, you will have further choices. Choosing Biography or History will take you to a page of suggested databases. 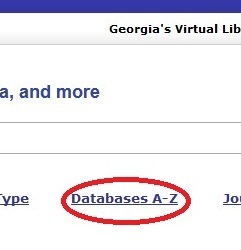 If you already know the name of a good database, click on "Databases A - Z" and you will be able to choose the beginning letter of a specific database, type in the database name, or click on "View All" to see an alphabetical listing of all databases. This scholarly collection offers full-text coverage of information in many areas of academic study, including archaeology, area studies, astronomy, biology, chemistry, civil engineering, electrical engineering, ethnic and multicultural studies, food science and technology, general science, geography, geology, law, mathematics, mechanical engineering, music, physics, psychology, religion and theology, women's studies, and other fields. After a Basic Search you may have way too many results and want to go to Advanced Search. Break your terms up so there is only one per search box. See below for help with the Boolean Operators AND, OR and NOT. Don't forget to refine your search using the limits in the blue bar on the left-hand side of the results page (see the visual image on the far right of this page) - the Subject limit is very useful. Boolean Operators connect the search terms together in different ways. 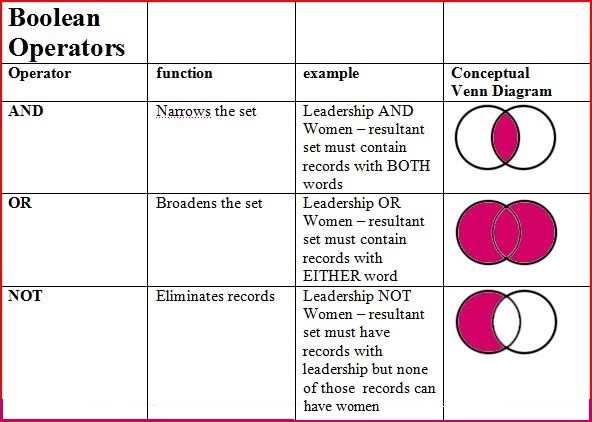 Boolean logic defines logical relationships between terms in a search. The Boolean search operators are and, or and not. You can use these operators to create a very broad or very narrow search. And combines search terms so that each search result contains all of the terms. For example, travel and Europe finds articles that contain both travel and Europe. Not excludes terms so that each search result does not contain any of the terms that follow it. For example, television not cable finds results that contain television but not cable. Note: When executing a search, And takes precedence over Or. You can get One-on-one help @ your library! If you are unable to find the full-text for an article you would like to use for the assignment, most likely the library can obtain it for you via Inter-Library Loan. Depending on how obscure the journal is, the article should be emailed to you within days. Click on this link to fill out the request form.